Join the discussion on our forums! Come discuss Crystal Lion over in our dedicated Crystal Lion discussion topic. Standard issue recruit gear: 1 silver sword, 1 Lordaeron insignia, 2 bags of crystal kibble. Could this be recruited by Call to Arms if it's discounted to 2 or less by silver hand recruits? Or does that discount only apply to the card if it's in your hand and not while it's in the deck? Edit: I'm guessing not because if that's the case then Call to Arms might be game-breakingly OP in a Giants deck. Even if you control 1 Silver Hand Recruit a 5 Mana 5/5 Divine Shield minion is decent. And if you're lucky enough in the draft phase you can combo this with Stand Against Darkness which is insane in my opinion. Crystal Lion would go great with coining it out with Level Up! on Stand Against Darkness. But that's one crazy and unlikely dream. Still, if pulled off, that'd be cool. And even if you just hero power, that's still a 7 mana 6/6 divine shield. Playable? Yes. Good? To be determined. So.... straight up worse Thing From Below? Blizzard's shititng on Pally continues, this card wouldn't even be great if it cost 1 less for every silver hand recruit you summoned but it would've been definately good. Now.... it's playable at best. 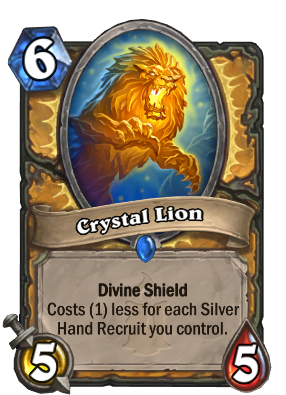 There is no way in hell you can maintain a good silver hand recruit board so it's a vanilla 6 mana 5-5 with divine shield but we can say there is going to be 1 recruit in play so 5 mana 5-5 with divine shield. Not good enough! Umm.. actually, that's straight up better Sunwalker, that can be cast t5 with two 1/1s. Not bad at all. Sunwalker has taunt. This doesn't. Wow, damn, I overlooked that. That changes things by a high degree. A worse Reliquary Seeker for paladin bad. edit, didnt see divine shiled, and its slightly more flexible, so its playable. This card should be like "thing from below" which makes it cost one less for each silver hand recruit you've summoned this game, which then it would live up to thing from below's standard. Making it cost one less for each silver hand recruit you control makes this unplayable. I don't see why blizzard make cards like this when "thing from below" exists. If you compare them, thing from below is considerably better considering you don't have to control the recruits. I really hope they change this so this card might actually be playable. Both of these scenarios assume you go first. These were just my thoughts. I think Blizzard would only print this card with Thing From Below text if it cost something like 8 or 9. Will we be getting more Duelyst themed cards in this expansion? The art style for Duelyst is phenomenal, so I would actually be happy with that. lol. In Wild, I only really get a good amount of Silver Hand Recruits in the late game, and by that time the minions themselves are usually buffed by Quartermaster and/or Lightfused Stegodon which make often make them more valuable than this since I can swarm the field with them. And even that is only after a lot of work involving Vinecleaver, Muster for Battle, Justicar Trueheart, and more. In Standard, it's a lot harder to make this work. It's harder to combine summoning and buffing the recruits at the same time so they stay alive and do work for you. And since this card relies on how many recruits are still alive versus how many you summoned, this card is essentially a reward for managing to fill your board with them. Stand Against Darkness can bring this out for 1 mana, but the earliest you can do that is Turn 5 with The Coin unless you somehow already control the board and have a bunch of recruits. And by that time there should be more pressing things that your opponent is doing that makes a 5/5 not so dangerous, even with a Divine Shield. That being said, I can't really find any space for poor Crystal Lion. I need the cards I already have to make the Silver Hand Recruits actually work and scale into late game. And since I am focusing on the recruits, I'm focused on buffing them and not the cards revolving around them. It has potential, it's not bad, but I don't think I'll find Crystal Lion taken seriously. Again, Silver Hand decks really don;t work too well because of thier low survivability. Although getting a 5/5 divine shield of 5 or 4 mana would be pretty nice so... maybe it'll work. Nobody notice that this is the 4th rare card for paladin? Does that mean Paladin got one more card than other classes or all classes will have 4 rares in this expension. Good catch. It may mean less neutrals in favour of more class cards, which I always prefer. Edit: I saw someone point out that the unidentified cards are all commons, so that may be the error. It will be good in wild, but if only play standard this must be dust.